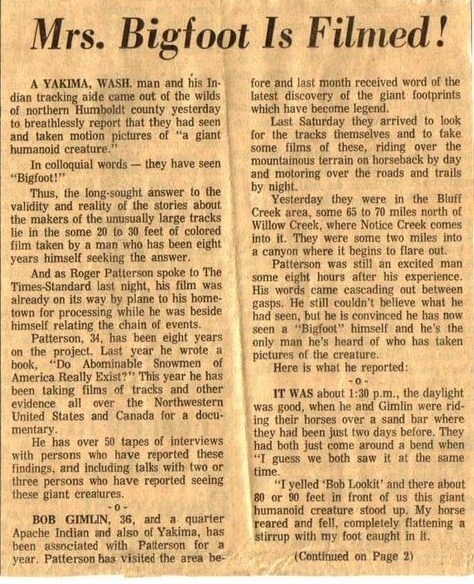 Bigfoot: "Mrs. Bigfoot is filmed" October '67 - 17, 15 & 9 inch tracks found... Mrs. Bigfoot is filmed!! "Patterson was still an excited man some eight hours after his experience"
Investigating further, there was no pay phone outside Hodgson's store. It would have been inside the bldg, near the check-out stand by the front door. Patterson sought to excitedly phone Betty Allen at the Times-Standard. said he phoned from Hodgson's store pay phone but there was no outside pay phone there? Hodgson's store in Willow Creek had closed at 6:00p? Was there a child, was the child hers? Nobody to this day ever wrote about a child being on the Bluff Creek sandbar, but clearly there is evidence of its existence in the photograph & Patterson's words above. isn't any record of those tracks being seen or cast ever again. Why would they suddenly up and disappear? What happened to the individuals that made those tracks? There is also written record of John Green and Rene Dahinden driving or flying by private chartered aircraft into the area on numerous occasions in late spring and summer of 1967, just to see these tracks. 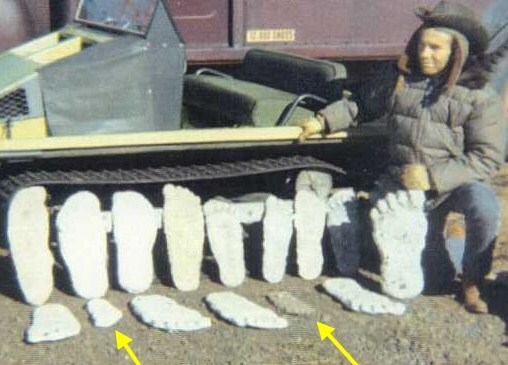 Would the average field man charter private aircraft to fly into another country just to see more Bigfoot tracks, most of which they had already seen before? only 6 words, "...what you're looking for is here!" There would have to be something else to cause Green's swift reaction! into a foreign country suddenly end? What happened that Dahinden & Green suddenly lost interest in the Bluff Creek area tracks? Why were so many tracks never recorded again? Come on researchers, this isn't rocket science. This email quote is from the late Don Davies to Dmitri Bayanov sent on January 1, 2002 appears to answer the age old question of 'who wrote the Times Standard article listed above? 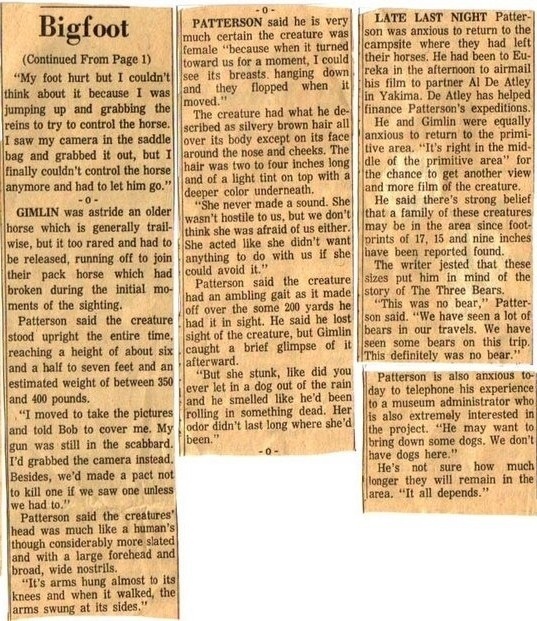 What reporter did Roger Patterson phone the night of October 20, 1967.' It was Betty Allen. Davies wrote: "I have been trying to get an answer to this question for some five years. The Times Standard would not reply to my inquiries, but the editor was once interviewed and asked the question. His answer was "it was a long time ago and they did not have time to go looking through the files. The author appears to be Betty Allen. As she was not a permanent reporter, we can reason that she would not be given a by line."